So What Did Magna Carta Ever Do for Box? Big Charter, as opposed to many smaller agreements previously issued). This article seeks to discover the significance of the charter for Box. All illustrations courtesy Wikipedia, except where marked. 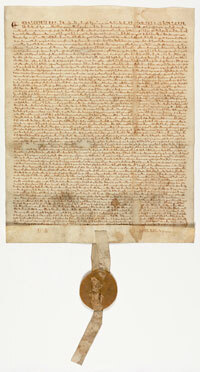 At the time, Magna Carta was a temporary peace agreement in a running battle between King John and 40 of his leading subjects, the English barons, who opposed the king's tax demands to finance a war in France. No freeman shall be taken, imprisoned, dis-seised, outlawed, banished, or in any way destroyed. Nor will We (King John) proceed against or prosecute him, except by the lawful judgment of his peers or by the law of the land. To no one will We sell, to no one will We deny or delay, right or justice. As a truce it was a total failure. Ten weeks later, John got the Pope to cancel the agreement as illegal. But it struck an enduring chord with people and was repeatedly reissued and referred to as a precedent to limit the behaviour of the Kings of England. There are four surviving copies of the manuscript: two copies owned by the British Library; the copy in the best condition is at Lincoln Cathedral; and one is at Salisbury Cathedral. The version issued in 1297 was called The Great Charter of the Liberties of England, and of the Liberties of the Forest and is still part of English law. People clung on to the wording of the agreement to justify their causes in later periods. The charter was cited as a precedent for the Parliamentarian side against King Charles in the English Civil War, 1642 - 1651, a proof that the king had exceeded his powers and was becoming a despot. A century later it inspired the writers of the Constitution and the Bill of Rights in the United States of America and encapsulated the word Liberty in the American psyche. To Victorian historians, it was the foundation of the Parliamentary system which the British Empire exported throughout the English speaking world. They claimed that the 1215 charter helped to establish the House of Lords (called the Magna Concilium) and that the rebellion in 1258 by Simon de Montfort created the House of Commons (of the Knights of the Shire). To find how Magna Carta affected the village we need to look at the reaction to the charter and the causes of the 1258 revolt. Samson (born about 1210 and still alive in 1267) lived throughout this period of great political change and open rebellion to the king. His father, Bartholomew, was in control of Box at the time of Magna Carta but the Bigods were not barons so they were not directly affected in 1215, only in the aftermath. In an effort to redress the setback in the king's authority, King Henry III courted support amongst the class below the barons, the knights of the realm. These knights became central to the running of the counties and were showered with paid offices, including coroners, keepers of the peace, escheators (holders of land confiscated by the king), assessors, collectors of tax, and justices of assize. Samson benefited directly as a paid official of the king. He was appointed justice in the Wiltshire sessions of the of Civil Pleas of 1249, responsible for selecting the jurors to adjudicate on both civil and common law cases. (3) But the post of royal tax collector was despised locally and rarely financially worthwhile. Open rebellion to King Henry III occurred in 1258 led by Simon de Montfort resulting in a statute that two knights were to be elected from every county to discuss royal tax demands. To some extent the knights couldn't fail: they were feted by both the royal and baronial causes because of their local influence. As one of the senior knights, Samson may have inclined to the king's side. He appears to have relished his status as a knight of the realm, created by swearing a mortal oath of fealty to the king and being dubbed as a knight by the king's sword. But he could not have ignored his responsibilities to his tenants who funded his wealth. He probably regarded the presentation of grievances to parliament as part of his local duties. 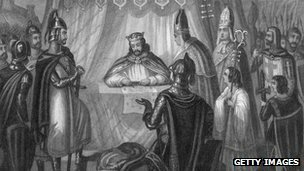 Perhaps the lasting significance of Magna Carta, more important than a pointer towards so-called democracy, was the stress it placed on the rule of law, rather than the authority of the crown. Locally, we can see that Magna Carta, and the promotion of Samson Bigod as a royal official, had repercussions in shaping the development of Box. But it is more difficult to see the result on the everyday lives of villagers. However, we can say that the Provisions of Oxford did affect Box. It gave them a voice for grievances and it also decreed that sheriffs were to be salaried officials (not tax farmers) appointed for a single year only. This brought some relief from the oppressive tax-raising of the royal officials, who had focused tax demands on the lower classes when the magnates had proved intractable (plus ca change ....). It enabled the peasants of Box to begin to generate farm surpluses and to retain wealth in late feudal society.